Imagine if dreams hinted at real life, if we were able to interpret them to better understand the future. In Parashat Mikketz, that is exactly what happens. We find Pharaoh waking up in a pool of sweat, haunted by his dreams, unable to fully understand their meaning. His butler, who had his dreams interpreted by a young Hebrew slave while in prison, remembers Joseph and sends for Joseph to interpret Pharaoh’s dreams. In Gen. 41:17, he begins to share his dream. He dreamt of Seven Cows fat and well fed, and seven cows skinny and starving. The seven starving cows ate the seven fat cows. Then a second dream: seven beautiful ears of corn, followed by seven additional ears that offered little food to eat. The seven latter ears of corn went on to eat the beautiful and plentiful bounty. Joseph explains that these two dreams are in fact one that hints towards a future of plenty followed by scarcity. Seven years of bounty followed by seven years of famine. Pharaoh hired Joseph and he organized the collection of food in the land of Egypt during the seven years of bounty so that during the famine, all citizens of the land would be prepared and still have plenty of food on their tables. While citizens of neighboring nations – including Joseph’s own brothers – came from far and wide begging for assistance, the people of Egypt were well prepared and well nourished. We did not have a Joseph to interpret our dreams – to give us the head’s up that the rich will become poor, that the bubble will burst, that a recession would hit our country. The famine that Joseph interpreted in our Torah is the famine that we are living in now. It is hard for many of us to imagine, because thank God, even during these troubling times in this nation, we are still able to have food in our stomachs and a roof over our heads. For many though, that is a great luxury. There are twenty-one counties in New Jersey, nine of which are in the top 100 riches counties in America. The wealthiest in the state, and one of the wealthiest in the nation is Hunterdon County, with a close proximity to Philadelphia and New York City. Residents of Hunterdon County have a median income of $91,000 per year. Hunterdon — this wealthy county — also has the highest increase of families who turned to food stamps this past year. Since December 2007 — the beginning of this country’s recession — the amount of Americans on food stamps in this country has almost doubled to a staggering 46 million people. In half of the states, one in every three children are on food stamps. 15.1% of Americans now live below the poverty line. According to DCF, Florida’s Department of Children and Families, 234,173 residents in Jacksonville received food stamps in the 2010-2011 fiscal year. That’s 27% of the county’s population. Even more alarming, food stamp recipients in Duval County jumped 105% from 2006 to 2010. Our society makes assumptions about those on food stamps. Yet, hunger is not a “them” issue. It is an “us” issue. Many of these families on Food Stamps have jobs and yet still, in this economy do not earn enough to pay for all of their expenses. After paying housing, energy, and health care expenses, there is little or no money remaining to spend on food without food stamp benefits. Even with governmental assistance, these food stamps rarely last an entire month and many still need to turn to soup kitchens, food pantries, or food drives. Depending on income and size of household, the Department of Children and Families of the State of Florida provides roughly $1.25 – $1.50 per meal for each member of the household. $1.25 per meal. A trip to Publix or Winn-Dixie shows how challenging that actually is. Milk: $2.60 a gallon. Sliced Cheese: $2.50 per package. Package of Dinner Rolls: $2.00. Living a life on food stamps is no simple task and certainly not something that anyone would wish on themselves. Still, during the first week in January, the Jacksonville Jewish Center’s clergy will be participating in the Food Stamp Challenge. Organized by the Jewish Council on Public Affairs, the Food Stamp Challenge is a program that encourages members of the clergy to spend a week “living on food stamps” to raise awareness and fight hunger. We will only be spending the amount of money on food that food stamps provide (approximately $1.25 per meal.) Each of us will be spending fewer than $4.50 per day, January 2nd-January 6th on food. That is just over $20 for five days worth of food. Our goal is not to starve ourselves. Our goal is not to prove a point. Certainly, our goal is not to make a game or a mockery out of another who is in dire straits. Our goal is to raise awareness. Living on a food stamp budget for just a week cannot come close to the struggles encountered by low-income families week after week and month after month, it does provide a new perspective and greater understanding. We will be blogging about our experiences, as well as tweeting and posting updates regularly on Facebook. My prayer is that our action will lead to our community taking action. What a powerful prayer. What a powerful statement. However, we all know, based on these statistics, based on reality, based on the world we live in, that is far from the truth. Most suggest that this is a prayer – a dream for a better future. We find in Breishet Rabba, Rabbi Eliezer explains that “a dream’s outcome depends on the way it is explained and interpreted.” Essentially, we dictate what our dreams mean. We have an opportunity to make our dreams a reality. Joseph interpreted Pharaoh’s dream and took action. My hope and prayer is that by all of us taking action, the year ahead will be a year when we can all say the words of Birkat HaMazon and mean them. Let us raise awareness, take action, and put an end to hunger in this country. Let it snow, let is snow, let it snow. Growing up in New Jersey, and spending the past decade of my life living in New York City, the celebration of Hanukkah is synonymous with snow. Bundled up in heavy winter coats, hats, gloves, and scarfs, we would spend hours playing outside in the snow (as a child and as an adult!) until it was dark. In the evening, we lit the Hanukkiyah and the lights of the Menorah would be the only light illuminating the snowy white landscape that had been otherwise hidden by the pitch black of winter. This year, I look forward to a Hanukkah without snow! Instead, this Hanukkah, my family’s first in Jacksonville, will be a Hanukkah full of sunshine. Still, I have no doubt that with the changing of our clocks last month, the days will still seem much shorter as darkness will set in much earlier. There is something comforting about gathering around the Menorah with friends, family, and community members. This sense of comfort is more than just creating light in the darkness. Rather, it is celebrating a miracle in our tradition while realizing the miracles of our lives, and helping others appreciate the miracles in their lives as well. With the “Hallmarkization” of the holiday, Hanukkah is simply about giving gifts for many. Don’t misunderstand me: I have no problem with exchanging of gifts on Hanukkah. I find it to be a wonderful way to celebrate the holiday. Yet, I worry that we get caught up in the material goods that we are giving and receiving and forget about the true gift of Hanukkah: the gift of light. As children, we all learned the Hanukkah tale of the “miraculous” oil burning for eight days. Such a story is hardly a reason to establish an annual festival. What the light actually represents is hope and new beginnings. The lights is ignited at one of the darkest points in our history. The Temple in Jerusalem was desecrated and many Jews assimilated and embraced cultural trends, pitting Jew versus Jew and seriously putting the future of Judaism in jeopardy. 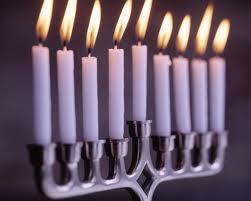 Yet, when the Menorah was lit, the Temple was rededicated and the light became a symbol of a new beginning. Tradition teaches us that the Jewish people are an or l’goyim, a light unto the nations of the world. When we light the Hanukkiyah we remember one of the darkest moments in our history and recognize that there are still pockets of darkness that exist in this world. The flickering flames of the Menorah act as a reminder that we must light up this world. Our mission, obligation, and responsibility as Jews is to take action and make this world a better place. There is no better moment than during the coldest and darkest time of the year — whether there is snow on the ground or sun shining in the sky — for us to metaphorically light up the world. “Lighting up the world” and being a light unto the nations seems like an awfully big task. In actuality, it is quite simple. We bring light to the darkness of the world and the darkness of people’s lives by helping those in need. The Center’s Social Action Community has done this through our successful Donate the Weight campaign and our continued Operation Isaiah Food Drive, by collecting and donating winter coats to Sulzbacher, as well as cooking, preparing, and serving food at Sulzbacher. We even light up someone’s life by reaching out, checking in, and seeing if friends, family, and community members need anything. We are grateful during this season for the gift of light. I know that with all the good we are capable of doing as a community the lights that we ignite in this world will shine bright! Andrea, Cayla and I wish the entire community a Chag Urim Sameach, a Happy Hanukkah. May the year ahead be much brighter for us all!